Stayed at this hotel in a side sea view room which were priced as best rooms, for our Son’s wedding in June 21st 2012. I don't know how it got it's 4star plus rating we would give it 2star. The hotel needs a complete refurbishment, the rooms were tatty with only one electric socket, mini - fridge (not) hardly a cooler and empty. Satellite TV was euro-sat only one English Channel BBC world news. The lobby bar reception area had NO Air conditioning for the whole two weeks we were there. The grass area for sunbathing was covered in some kind of beetle and cockroaches, all the sun beds and umbrellas were old, if you didn’t have a bad back when you got there you will by the time you leave, and it's not what I would call on the beach. English Weddings, if you want something special don’t go here, squeezed 3 into one day which made things run late which meant we were all sweating in reception again. This hotel caters for Cypriot Weddings and Prom Parties which take over the hotel and we were restricted to the reception with a pianist for entertainment and still sweating. Although we were all inclusive we had to leave the hotel on numerous occasions. Good points food and staff. Would not recommend this hotel to anyone. When we arrived at the hotel we thought it was beautiful and it was recommended to us by our tour operator. As we were planning to get married in Cyprus this hotel was a very good choice. The rooms were very nice and each day we had a different art piece on our bed made out of towels which was nice the rooms were cleaned every day. All the staff were very friendly and helpful at all times from cleaners who were always pleasant and reception and bar staff always helpful. There’s an indoor pool with sauna and steam room and a gym so lots of facilities. The pool area was amazing with the bridges going across it and an ideal place to get married there. We saw lots of weddings before ours and they were all stunning with lots of areas on the hotel ground to have photos taken. We liked the idea of having the hotel Maris next door to us to which was also the sister to the Cypria bay so you could also use their pool and bars too. The entertainment wasn't brilliant but was good if you have children but was a bit cheesy but if you did't want to sit and watch entertainment then you could sit on the terrace of either the cypria bay or the maris side and just enjoy the views and a quiet drink. The food was very good with lots of choice and different every day so you couldn't complain and food was served from breakfast at 7.30am then right through till 10pm for dinner with midnight snacks of sandwiches being served 10-11.30pm. We were there a week before we got married and our family flew out a week later they put us all together and accommodated us throughout the holiday. We had an amazing wedding here and very stress free, the planner was amazing and the hotel sorted out the reception for us which was fab. I'd highly recommend getting married here or just go for a holiday because we loved it. Have just returned from 11 fantastic nights at the Riu Cypria Bay. Transfer time from Paphos airport only 20 minutes. Check in was very easy and reception staff friendly and helpful. Room on the 3rd floor with pool and sea views. Rooms cleaned to a very good standard every day and always came back to amazing towel art. Pool towels supplied that can be changed at reception. Great selection of food at each meal time and snacks in between. Animation team work very hard with activities all day, but are not pushy, special mention to Louise who was brilliant. Lots of weddings at the hotel on the beach which were lovely to watch. Did not watch a lot of the evening entertainment but what we watched we enjoyed. Would definitely recommend this hotel and would not hesitate to return. This hotel is in a nice location and is very clean. We also had read bad reviews before going and were concerned but needn't have been. Rooms were comfortable and clean a bit dated but soon to be refurbished. Fridge, TV and hairdryer in room. We were able to keep air condition on all day which was great as temperatures were averaging 40 every day. Food was good, always plenty of choice a good selection of well cooked meats, vegetables and salad. Breakfast could be eaten outside. Lunch and Dinner eaten at either Maris or Bay. Dinner was in two sittings where you were given a table and asked to eat at same time each night. We chose the 8.30 sitting at the Maris and used the Bay if we wanted to eat earlier. Both restaurants served same menu. Pool areas and gardens were kept very clean plenty sunbeds and umbrellas for everyone. During our second week new sunbeds and beach towels were in use. Staff throughout the hotel worked hard and were very helpful, they couldn’t do enough for you. Entertainment team also worked hard but we didn’t bother with it, preferring to walk into harbour of just sit in bar. First time in Cyprus, our friends said Paphos was the place and it was as we have fallen in love with it. 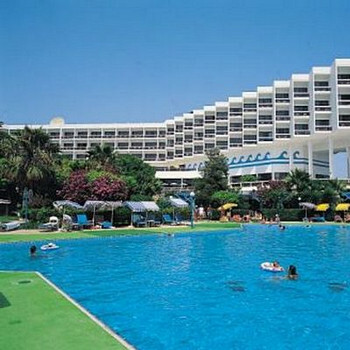 The Cypria Bay Riu Hotel is beautiful as it is on the beach front. My wife and I who I married while on this holiday stayed at the Maris Hotel. After we had arrived at the airport we got on the bus which took us to our hotel in around 20 minutes. When we stepped into the hotel we were met by this lovely Greek English speaking porter who welcomed us like warmly getting us drinks as he took our cases. Inside the hotel there is four floors with lifts on the bottom floor you had a lovely indoor pool, reception, dining room and shop. As you stepped outside to our surprise the bay was bigger than we had thought it was going to be. Our room was nice and clean, and from our balcony you could see the whole bay. The rooms where kept nice and clean every day. There was plenty of nice food to eat at different areas of the bay as you can use the Maris sister hotel the Cypria bay hotel as well. The entertainment was good fun and was always good to look forward to at night with a few drinks. Would really recommend this hotel to anyone, probably not up there with the best hotels in the world but well worth the money. Well, Just got back from Cypria Maris / Bay on 5th June 2011. Like most people I was concerned about the comments regarding the Maris. To be fair it was fine and there are more reasons for staying there than avoiding it. It does not really hit the four star mark, they have done some renovation work in the lobby and it was a good standard. It is in need of an upgrade but having just stayed there it was perfectly adequate. The good thing about this RIU resort is that you can use all the facilities at both hotels, for example we stayed in the Maris but ate all our meals in the Bay hotel. The advantage to the Maris is that it is quieter in the day with not as much noise around the pool. The bay however has a swim up bar and nicer pool. The bay is far more modern but noisier. The food was very good in both and is from the same central kitchen so the food standards do not differ. The restaurant in the bay is much nicer and you can just book all your meals there no problem. We used the outdoor restaurant at the bay for lunch and it was very good food indeed. The Maris is just older and in need of modernisation but has perfectly adequate accommodation and is cleaned regularly. The beach for both was not up to much but that is reflected in the area. I would not be bothered about staying at the Maris as you get the best of both worlds. Obviously the spirits are not recognised brands but local alternatives which are OK. The beer was KEO which is very good. Helpful staff , entertainment a bit naff. Bus ride to harbour costs 1 and takes ten mins. 15 minutes from the airport. Don’t pay too much attention the over negative comments on some websites. It’s fine. Went to the Riu Cypria for our Daughter’s wedding and it was excellent! The rooms were fantastic, the food was excellent. The only downside was that Thomas Cook didn’t tell us about all the extra costs which would be incurred with the wedding. Make sure if you’re getting married bring plenty of money or credit cards with you! We went to Cyprus to get married and we were made very welcome at the Cypriot Bay Hotel. The hotel was very clean, the staff were friendly, the maids kept the rooms clean and left flowers and lovely towel displays daily but they did not change the beds as often as would of liked. It did not have tea making facilities which disappointed me as I wake early and like my cup of tea! The food was good; a good choice each day. The daytime entertainment was good but the evening was poor. The pool area was very nice, always cleaning and had plenty of sun beds. When we visited this hotel, We were a bit apprehensive what to expect after all the reviews We had read. Some people are constant nitpickers. We had a fantastic holiday the entertainment was great, excellent choice of food. The only thing I would say its location it is a bit of a walk to Paphos. It's right on the beach which is great when you want to swim in the sea. It was a family holiday with our teenage daughter who had a really good time. As a matter of fact we have booked to go again this summer.